Since 1922, people worldwide have enjoyed our freshly baked goods. We take pride in the traditions we've created in our family, as well as yours. we hope you will enjoy our love of tradition. All orders placed after Noon Thursday - Sunday will ship within 1-2 business days the following week. We will notify you of any backordered items which may delay your shipping date. 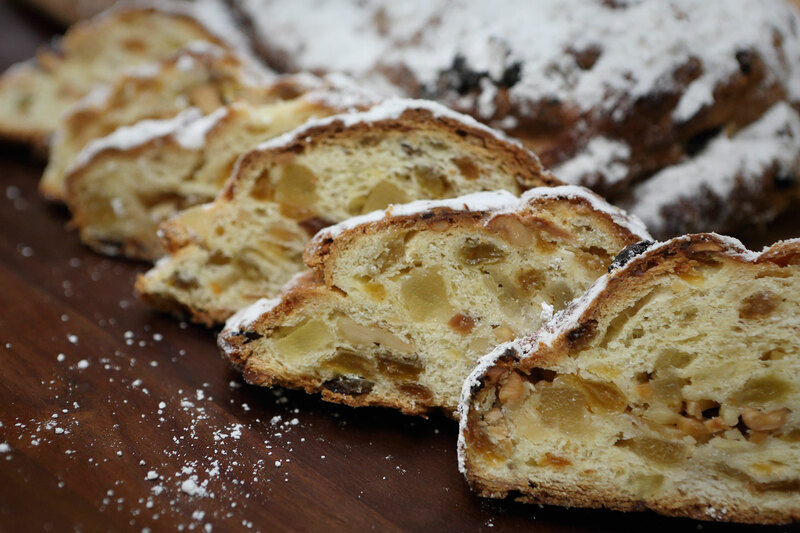 Our Famous Stollen recipe calls for roasted cashews, California almonds, juicy pineapple and golden raisins all dipped in rum and brandy then imbedded in yeast raised dough before baking. In the final step each Stollen is glazed with melted butter and lightly dusted with powdered sugar. Two of our 1 lb Famous Powdered Sugar Stollen and each individually wrapped. A real customer favorite!